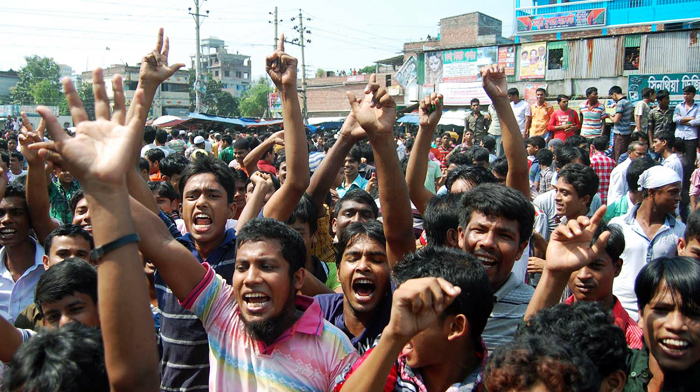 Several hundred workers of different garment factories have been staging demonstration in front of their respective factories in Konabari and Kashimpur areas in Gazipur demanding raise in their wages since Wednesday morning. Several hundred workers went on work abstention from their respective workplace around 9 am and started staging demonstration, said Emdad Hossain, officer-in-charge of Konabari Police Station, quoting witnesses. The agitated workers took to the street and later tried to put up barricade on Dhaka-Tangail highway, but police moved them away from the spot, the OC added. Earlier on September 13, the government raised the minimum monthly wage for the garment workers by around 51 percent to Tk 8,000 from the existing Tk 5,300, with effect from December this year. However, some trade union leaders rejected the proposed hike and urged the prime minister to review it as soon as possible. They demand that the minimum monthly wage be fixed at Tk 16,000. On November 26, the government has published a gazette notification fixing Tk 8,000 as the minimum wage of garment workers.